Please note that ZapMessenger 1.0 is not compatible with Windows Live Messenger (or Essentials) 2011 or 2012. No damage will result if you have tried to do use the utility, but due to a substantial change in how Messenger installs itself, ZapMessenger will not work. An updated version is almost ready, but I am looking for testers who can directly report back on if it was successful in solving their problem. If you’re interested in helping out, please leave a comment below! A regular issue faced is the dreaded “Another version of the product is already installed”, “Your computer has a newer version of MSN Messenger than the one you are trying to install”, ““Your computer has a newer version of Windows Live Messenger than the one you are trying to install”, “The feature you are trying to use is on a network resource that is unavailable” and similar messages. Additionally, in some cases the installer can’t be found in the Control Panel’s Programs applet or has become damaged with a Catastrophic failure (0x8000ffff) error or the Windows Installer is prompting for a missing .msi file which you can’t find anymore. There are fixes for all these problems, but they’re complicated and can be frustrating to some people. 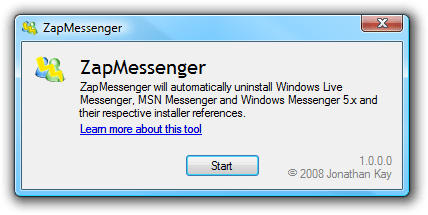 With all this in mind, I developed ZapMessenger – the one step tool to completely remove Windows Live Messenger, MSN Messenger and Windows Messenger 5.x. The first thing ZapMessenger will do is attempt to cleanly uninstall Messenger normally and if that fails for any reason, it will forcibly remove Messenger from the Windows Installer engine allowing you to reinstall at your leisure without hindrance. To use ZapMessenger, just download the zip and run the executable. No installation is required. Please note that the .NET Framework 2.0 or above is required, which you can install from Microsoft if you don’t already have it. The Framework has been on Windows Update for quite some time and is included in Vista by default, so more than likely it is already installed. Will this remove any of my personal customizations – emoticons, display pictures, etc.? No, currently ZapMessenger deals with the application itself – your personal data will remain and won’t be touched. I am considering adding this an option to future releases for those looking to do a complete “clean” install. Posted on November 19, 2008, in Messenger Tools. Bookmark the permalink. 178 Comments. Hi, is there any new version of the Zap tool? I want to remove my WLM 2011 completely and install the 2009 version using the Reviver. Greetings Symphony. Yes there is in fact. It’s not polished yet enough for mass public use, but it’s fully usable and fully functional. I’ve sent you the link to it by e-mail. It detected quite a bunch of Windows Live products, some of which I didn’t even know they were installed. What exactly is MSVCRT and D3DX10? Doesn’t the second one have something to do with DirectX? And another question.. If I remove WLM 2011 with the tool and install the 2009 version afterwards, will all my custom emoticons disappear as well? Or is there a way to keep them? Thanks for testing that out 🙂 Live Essentials 2011 and 2012 have crazy dependencies which is what took me so long to create ZapEssentials. MSVCRT is the Microsoft Visual C++ Runtimes. In Live Essentials 2011 it will be version 9 (also known as Visual C++ 2008). D3DX10 is DirectX 10.1, but it’s just an extension DLL as DirectX 10 is part of Windows Vista and above. I created ZapEssentials (and ZapMessenger) to help deal with the crazy installer problems created by the Live Installers, so your emoticons, winks, etc. will all be retained and won’t be removed since they’re not part of the installation process. They’re also the same data format so you can move them throughout the versions without any issues. No matter if I try installing the 2009 or 2012 version, it doesn’t work. Can it have something to do with the fact that I have Skype installed on my PC? And I tried uninstalling Skype, it didn’t help. Yeah, Skype isn’t part of Essentials so it won’t matter. If you run ZapEssentials again, does it pick up any products at all? Assuming not, one of the things that would happen after the shortcuts is the removal the Essentials cache. This is the \Program Files\Windows Live\.cache folder (Program Files (x86) if you’re using 64-bit). This folder is hidden by default as a system folder so you’ll need to turn off ‘hide protected operating system files’ in the Explorer options View tab to see it. Just delete it and see if that solves the issue. I think I know why it got stuck at the shortcuts, but I’m not too sure why I never encountered the problem myself before. Greetings nza. I’ve sent you an email. I need the latest version of ZapMessenger , help !! Hi Jonathan! I’m making a friend of mine install Messenger, but there’s a problem about an “older” version on his PC and he can’t find it. So I looked up the forums and found this, but right now it seems like your download links are not working. Could you provide a correct download link? Thank you very much in advance! You caught me in the middle of moving servers around, it should be working now! Nice! The download works and the software worked perfectly, too! It’s great to connect with my friend on MSN again, thanks a lot Jonathan! Hello, with ZapMessenger I can not uninstall anything other than Messenger and Microsoft SkyDrive, how can I uninstall the rest … Mail, Writer, Photo Gallery and Movie Maker.